While goofing around asking UK indie game developers for their top 5 games of all time at World of Love, I was very pleased to hear that the amazing ZX spectrum strategy game Chaos featured in multiple lists. I love Chaos so much that I developed Law, a Chaos remake at university as a way to learn Java. 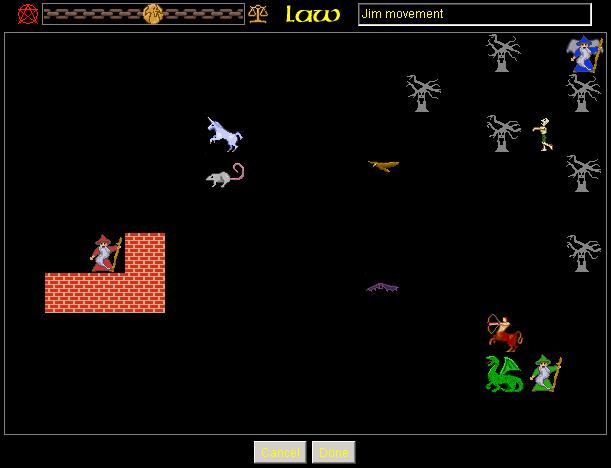 It turns out that a bunch of other people love Chaos too: a year or so ago one of the administrators of the Chaos Remakes Wiki got in touch with me to say that he’d been able to pull a copy of my original web site from an archive and wondered if I still had a copy of the game itself. The reminiscing at World of Love was enough for me to finally wade through decade old backups looking for a copy of Law and I’m happy to say that I found a copy and that it still runs on modern Java runtimes. If you remember the original Chaos, head over to the Chaos Remakes Wiki and indulge in some retro gaming nostalgia. If you’d like to tinker with it (please fix the yellow text on grey dialogs and add AI wizards!) the code is available under the GPL license from BitBucket.